The Philco Radio and Bar was advertised in the December 10, 1935 edition of the Times-Picayune. 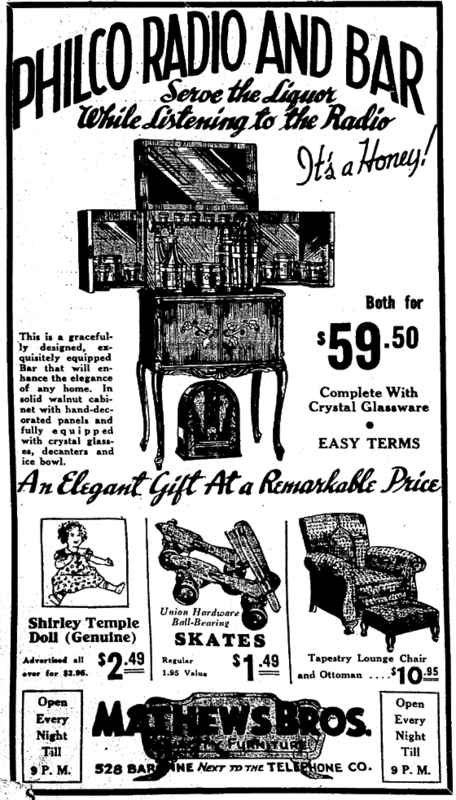 For a mere $59.50 one could have a radio and "this gracefully designed, exquisitely equipped Bar that will enhance the elegance of any home" -- "Complete With Crystal Glassware". "It's a Honey!". Who wouldn't want to "Serve Liquor While Listening to the Radio"? For the younger set, Matthews Brothers Furniture at 528 Baronne Street ("Next to the Telephone Company") offered Genuine Shirley Temple dolls for $2.49 and pairs of skates at $1.49. On December 10, 1977 Levon Helm and with the RCO Allstars and Detective performed at A Warehouse. Jazzman Irving Fazola was born on December 10, 1912. The schooner Nuestra Señora del Cármen, owned by Don Prospero Ferrayolo was used as a temporary jail during the period December 10, 1794 to February 26, 1895 after the great fire of of December 8, 1794 destroyed the royal jail along with hundreds of other buildings in the city. We've all passed the faded pastel pink and blue art deco building at 5712 South Claiborne Avenue and many of us have wondered why it is painted as it is. But when it first opened it was much more colorful. Eleanor McMain High for Girls first welcomed ----- on February 1, 1932. It was the only New Orleans public school named for a living person, but an exception had been made to honor Miss McMain who had done so much for so many through her work at Kingsley House in the Irish Channel. Under McMain's guidance and leadership, Kingsley House had grown from a modest parish outreach program at 929 Tchoupitoulas of the Trinity Episcopal Church parish to an internationally known settlement house. Elanor McMain must have been bowled over by what Times-Picayun writer Podine Schoenburger described as the "new high school which combines luxury with efficiency" in a symphony of riotous, splashing color". The photos here are new. The following descriptions are from Podine Schoenburger's January 10, 1932 article. The colors described by Shoenburg don't match the modern-day colors but give us aglimpse or what the building looked like so many years ago: The exterior of the stucco school building was painted green. Schoenburger described the "strange colorful entrance" with vivid blue urns, one at each side of the main door, in which century plants were growing. The carved tops of the white pillars flanking the doorway were painted green and cold. The doors were of leaded glass with a basket of brightly colored flowers topping them. Green grinning gargoyles topped them all, and above them the nameplate was blue with with gold letters spelling out the school's name amid a pair of gold lions. High above the entrance of the three-story building are two sculptures by Albert Ricker. The first depicted a young Acadian maiden in a blue dress, starched apron, and a spinning wheel at here feet to symbolize industry. The second figure is of an older woman, with an owl as symbol of wisdom. As the girls stepped inside onto inlaid terrazo floors, two cream-colored curved staircases with carved balustrades and mahogany rails could take them up the the principals office, the main office, or the teachers room. The principals office opened to a brightly tiled, yellow-walled court yard with a blue, green, and yellow fountain, providing a "tropical atmosphere". The classrooms were finished in green, blue, and pink in a "modern style in perfect keeping with the personalities of the lithe creatures who will people it". Each room had a telephone. Some large rooms could be divided by accordion doors which, when closed, provided a series of blackboards. The building was equipped with radio and loudspeakers. Oscillating heaters were employed on the ground floor; ventilation and heat throughout the facility were "modern to the nth degree" and there were "many and generous windows". The auditorium"resembles a large theater" with a saucer-shaped balcony, special switchboard for stage lighting, a projection booth "for showing both silent and talking pictures", and an asbestos curtain side-draped with gold and blue velvet. It could accommodate 3000 people. According to the school board architect Edward C. Meric, who worked with chief architect E.A. Christy, the "Vivid coloring is built after the fashion of such school buildings in the East and Middle West". Schoenburger noted the "gay colors and scientific educational aids" at McMain. There were, in fact, four science labs, 40 classrooms, a 5000 book library, and a modern cafeteria in the building which measured 180 x 390 feet and was built at a cost of $550,000. This "colorful structure embodying many new ideas in education was opened under the direction of Miss Alice A Leckert, principal. E.A. Christy submitted building plans for school on August 13, 1930. McMain was scheduled to open on the same day that the new boys school, Alcee Fortier was to open, in February 1931.. The building permit for McMain was approved by city engineers on October 29, 1930. J. A. Petty was the builder of the school located on South Claiborne between Joseph and Nashville streets. Construction work started in November. On December 10, 1930, Miss Leckert, principal of McDonough No. 14, was named as McMain's first principal. Fortier opened as planned on February 2, 1931 but McMain did not. As Fortier welcomed as many as 1500 boys, McMain's first floor had yet to be completed. According to Christy, difficulties were encountered in the foundation and excavation because "the site was once a swamp". The builder expected to sink 45 foot pilings but instead was forced to use 70 foot piles. To further the delay, many tree stumps had to be removed from the boggy location. Girls who were scheduled to attend McMain, whose student boundaries were South Carrollton, St. Charles Avenue, Howard Avenue, and Loyola University, enrolled instead at Sophie B. Wright. The opening of McMain was rescheduled for the fall of 1931. Plaster-work for McMain was executed by Sam C. Ball and Company, whose work could also be seen in five public markets and the old U.S. Mint. In July, $13, 730.36 was approved for purchasing furniture and equipment. On September 6, 1931 registration was open for McMain students but their school was still not ready. Nicholas Bauer, Orleans Parish Superintendent of Education announced that it would open on September 31. But on September 12, officials announced that the school would not be opened until February of 1932. In January,, Fortier boys held their graduation exercises in McMain's auditorium but liens against the McMain contractor threatened to delay the girls school's February opening. After legal wrangling, McMain finally opened its doors to the public on Sunday, January 31, 1932 from 4 to 7 p.m. when a reception was hosted by the teachers. The 917 students' first day was Monday, February 1, when the girls gathered in the auditorium for speeches by local dignitaries followed by a flag raising ceremony with music provided by the Warren Easton band. Born in the charity ward of Touro Infirmary ("We were not well off", she said) on December 10, 1914 (some sources dispute this date), Mary Leta Dorothy Slaton grew up to be a movie star. She attended Beauregard elementary school, where from she remembered playin hooky to go to Canal Street to pay 15 cents to spend the day watching the same movie over and over again. She was hooked. The daughter of John Watson Slaton and Carmen Louis LaPorte, she was also raised by her cousin Jeanne Deshotels and her mother Jeanne Schwerz. After divorcing Slaton, Carmen married Clarence Lambour and Dorothy took his last name. Deshotel remembered taking the young "Dottie" to St. Louis Cathedral whereupon the child sang the 1918 jazz hit "Ja-Da (Ja Da, Ja Da, Jing, Jing, Jing!) when the organ began playing. "I was so embarrassed", she said, "I couldn't shut her up". As a teenager, she began entering beauty contests. In 1929 Dottie took first-place in a Biloxi pageant and earned the title Miss American Legion of New Orleans. 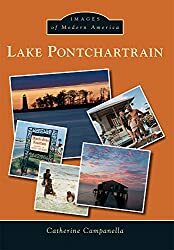 On July 26, 1930 she was a contestant, along with her friend Dorothy Dell Goff, in the Miss New Orleans beauty contest at Pontchartrain Beach's original location at Bayou St. John and the lakefront. Goff was crowned queen, and Dottie took fourth place, in front of a crowd reportedly of 10,000 people. A few weeks later, on Friday, August 1, 1930, Dottie and Dorothy boarded a 9 p.m. train at Union Station along with their mothers to head to Galveston for the International Pageant of Pulchritude (the Miss America and Miss Universe contests). Dottie's ranking in the New Orleans pageant qualified her as an alternate for Goff, who was crowned Miss United States (Miss America) on August 5, 1930 and then Miss Universe on August 10, 1930 in the Texas pageants. Goff, as Dorothy Dell became a film actress whose young life was cut short in an automobile accident on June 8, 1934 near Pasadena, California. Dottie Lambour won the 1931 Miss New Orleans contest wearing a blue bathing suit and a blue linen dress she had bought on Canal Street for $2.98. Miss Lambour is seen here in an advertisement for Club Forest (407 Jefferson Highway) on June 7, 1931. She did, in fact, go on to the 1931 Galveston pageant but failed to take a crown. She attended Spencer Business College and took a job in the real real estate business but still dreamed of fame. According a 1974 interview with local writer David Cuthbert, Dottie bought two tickets to Chicago, left one along with a note to her mother, and left New Orleans for a bigger city. Her mother arrived the following day. They took jobs in a restaurant, with Carmen in the kitchen and Dottie waiting tables. She said the trays were too heavy for her to carry so "I walked into Marshall Field Department Store. I had a terrible inferiority complex but when you do you put up more of a front." "I want to see the supervisor" she said, to which the response was "Which one?" "Well that stopped me. At D.H. Holmes and Maison Blanche all they had was one. In those days at Marshall Field they had nine. All I could get out was 'I want to ride an elevator'. She got the job.While performing at a night clubs she was "discovered" by orchestra leader Herbie Kay who hired her to sing for his band. A November 23, 1936 article mentioned that Dorothy Lamour "once of New Orleans, is seen in a short feature on the Saenger bill" which was likely a short film adopted from her New York radio show "Dreamer of Songs". Local entertainment writer Charles P. Jones, in a January 17, 1937 article, briefly reviewed "Jungle Princess" (starring Lamour and Ray Milland) which was playing at the Tudor Theater. "Miss Lamour is given a chance to sing as well as act, and the picture is certain to make its heroine and impressive movie figure", he wrote. And so it was. Not to mention that Dottie's "impressive figure" was wrapped in a sarong which made her as famous as she made it. Costume designer Edith Head admitted that her sarong was "born" for "Jungle Princess". "It wasn't even authentic", she said. A real sarong wrapped the body only below the waist but that "wouldn't clear any censor". Head also described the process of selecting the sarong wearer for "Jungle Princess"; a nation-wide search by the studio brought in state winners for screen tests; each young woman wore the same sarong, same bracelet, and same blossom behind their ears; the wolf-whistle originated during Lamour's screen test as stage-hands watched and the wolf-whistle became a "system" at the studio whereby a certain number of whistles predicted a young actress' probable popularity with the general public. The sarong and Lamour teamed with Hope and Crosby and went "on the road" to Singapore (1940), Zanzibar (1941), Morocco (1942), Utopia (1946), Rio (1947), to Bali (1952), and Hong Kong (1962). Dottie came home to celebrate her 50th birthday on December 10, 1967 while on a tour starring in "Hello, Dolly!" which ran at the Municipal Auditorium on Saturday, December 16. Back home again to perform in "Fallen Angels" at the Beverly Dinner Playhouse on February 22, 1974 she said to David Cuthbert of the Times-Picayune "Honey, those studios biographers didn't care what they said about you. They had me born in Chicago, New York, got may age wrong -- I don't care what the World Almanac or the film books say, I am 56, NOT 59!"